BullGuard Mobile Security – Latest Smartphones such as Android mobile phone devices, blackberry phones or Windows phone 7, are more complex than desktop computers were just a few years back, and carry most of the the identical security risks. As we all knows that your smartphone is almost as powerful as the desktop PC. It contains a ton of personal data, and it’s easily lost or stolen. How can you protect both device and your own personal data? Don’t worry, I have an answer for this question, I have found one of the best anti-virus for mobile devices, named BullGuard Mobile Security. BullGuard Mobile Security protects your phone from viruses, spyware and from losing vital data when you lose your phone. They have developed a comprehensive mobile security suite that provides mobile antivirus protection, with state-of-the-art features to keep you safe online. The suite includes a web based interface that provides remote access to your device if it gets lost or stolen, including lock, wipe, backup, SIM card protection, alarm, and GPS functions. They provides advanced technology to everyday users and serve it up in a user-friendly and intuitive design. They used radical technology which is miles ahead of anything else, giving you the power to enjoy and explore everything digital. It’s simple to use, logical and functional. 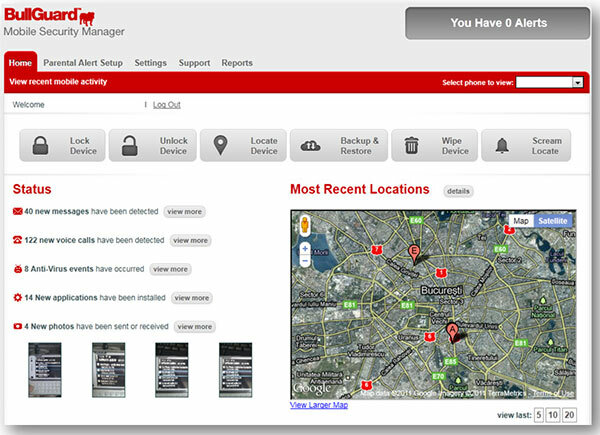 BullGuard Mobile Security available for Android, Symbian, BlackBerry or Windows Mobile. So download it soon and protect your smartphones.